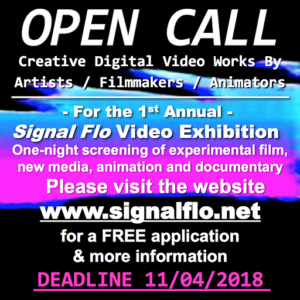 The First Annual Signal Flo Video Exhibition will be held in Gainesville, Florida as a one-night screening of experimental film and new media. Submissions are accepted through 11/04/2018. The purpose of this event is to highlight creators residing in the Sunshine State and to promote innovative work in the video arts. To apply, please visit the website www.signalflo.net for access to the Google Doc, or simply click on the link provided below. All skill-levels, themes, mediums, and video lengths are welcome! Please share with your friends who may be interested! Participation is FREE. Attached is the official Call to Artists PDF. Thank You!! !